If you’re a dog lover, then your big or little canine pal is probably much more than a pet. In fact, chances are your “Spike” or “Sassy” is a full-fledged part of your family. Nonetheless, no matter how much you love your dog, you don’t want him or her ruining your stylish new floor. So, what’s a dog owner to do? Get a dog-friendly floor of course! However, before we dive right into today’s best dog-friendly flooring options, we should first discuss the worst types of floors for your canine’s claws. There are no “rules” per se when it comes to the best flooring for dogs. If you want natural hardwoods or carpet, you can certainly have either. However, don’t be surprised if your expensive wood floors end up scratched or your carpets need regular cleaning. The fact is, for dog owners, some flooring options are worse than others. Dogs and carpet don’t get along. 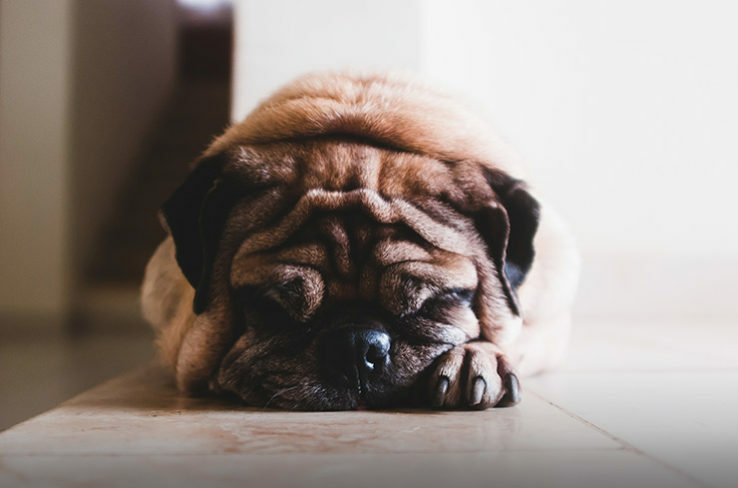 Sure, carpet is soft and warm, and your pooch may love to lay on it for hours on end, but dirt, dander, and fur are easily trapped in carpet fibres. Unless you’re okay with vacuuming daily and cleaning your carpet weekly or monthly, it will only be a matter of time until it needs replacing. Plus, carpets trap much more than dirt and fur. They also store, ticks, fleas, and any other pests your pet pooch may unknowingly bring inside. Yuck! We already touched on this, but solid hardwoods are another terrible flooring option for dog owners. In fact, hardwood flooring, regardless of whether it’s oak or Brazilian chestnut, is kind of like that expensive dry clean only dress or suit sitting in the back of your closet. In other words, it’s high maintenance. Unless you’re Warren Buffet, Mark Zuckerberg, or some other wealthy person who can afford, well, anything, you’re going to want your expensive hardwood floors to last. Also, unless you love constant cleaning and maintenance, chances are you don’t want to waste your energy dealing with scratches and puppy pee. Nonetheless, if you still have your heart set on sold hardwood floors, engineered hardwood flooring is definitely the way to go. It requires less maintenance and upkeep than traditional hardwoods yet still provides the same classic look and feel. However, as you’re about to discover, there are much better dog-friendly flooring options. So What’s the Best Flooring for Dogs (and Other Pets)? Our #1 choice is vinyl flooring. Vinyl flooring often receives a bad rap, but it’s by far the best flooring option for dog owners. Not only is it inexpensive and easy to replace, but it’s also water, scratch, and stain-resistant. This means it will stand up to doggie paws and stay looking new for longer. I know what you’re thinking: vinyl, really? However, today’s vinyl flooring is far from your grandma’s outdated linoleum. Thanks to modern advancements in vinyl design and development, it looks just as good as it is durable. In fact, many homeowners have a hard time distinguishing it from traditional wood and stone flooring. Our runner up for flooring choices for pets is tiles. Tile is another great flooring option for dog owners. It’s durable and provides a timeless look that will always be in style, regardless of the decade. Tile is also super easy to clean and requires no maintenance except for the occasional grout cleaning. This alone makes it a popular choice for many dog owners. Puppy have an accident? Simply grab some paper towels and wipe it up. Have an Irish Setter or another long-haired breed famous for shedding? Pull out the broom and sweep up the hair. As far as drawbacks are concerned, there aren’t many. However, one of the biggest cons of tile is price. 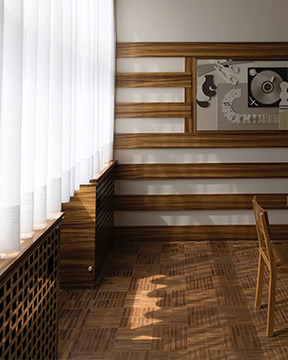 Unlike vinyl, it can be costly to install and replace. Tile is also hard and cold, but this can easily be solved with some rugs and dog bed for your canine pal to lounge on. Our honourable mention goes to laminate. 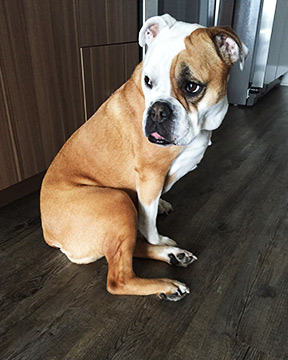 Despite being recently replaced by vinyl as one of today’s top flooring choices, laminate has been a popular option for home and dog owners for quite some time now. Why? Well, in addition to resembling real wood, laminate floors are durable, stain-resistant, and easy to clean. They’re also much less expensive than hardwood floors and tile. With all it has going for it, laminate flooring should be a dog owner’s first flooring choice, right? Wrong. Despite all of these attributes, laminate floors don’t exactly knock it out of the park in the durability category. They simply don’t hold up to time and the wear and tear of dog paws as well as tile and vinyl. Plus, laminate isn’t scratch-resistant. Laminate floors are also quite slippery. Unlike tile with textures and grout for traction, laminate floors are extremely smooth and easy to slide around on. Imagine putting on a pair of socks and sliding across the floor like Tom Cruise in “Risky Business.” That’s what dog’s feel like when walking on laminate, and they don’t even need socks! When it comes to dog-friendly flooring, vinyl is king. It’s inexpensive, scratch-resistant, stain-resistant, waterproof, extremely easy to install or replace, and even easier to clean. What else could a dog owner ask for?